THIS WEEK I’M going take a brief look at the species found in commercial waters. It would be impossible to cover all of them in the finest detail but I’ll try to convey a general impression. Let’s start with the one that it’s all about. They don’t call ’em ‘Commercial Carp’ waters for nothing. Carp are the fish that have transformed the coarse angling habits of a generation, and it’s not difficult to see why. Fast growing, hard fighting, willing to feed, and tough, this is a species that can be caught by novice and expert alike. They’ll take a wide variety of baits on many methods, and that makes carp the ideal fish. Furthermore, heavy stocking can almost guarantee sport in all but the coldest of conditions. Ask the owners to establish exactly what carp are in the water you intend fishing. Some newly stocked waters have lots of little ‘uns; fish of less than a pound but most waters have plenty of single figure fish (ie, less than ten pounds) that provide the mainstay of sport in this type of water. 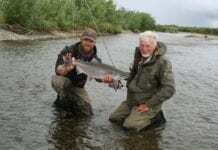 Many waters now have double figure fish and even twenty pound plus fish cannot be ruled out. It is important to have a good idea of what is in the water as this dictates the angling approach. It’s not so much the size of the biggest as the size of the run of the mill fish that matters. There is a world of difference between the tackle required on a water where the majority of carp are well into double figures, and one where they average barely a pound. In many cases, tackle that could be best described as barbel tackle will do the job admirably for fish in the five to fifteen pound bracket. For fish up to five or six pounds specialist tackle for pole fishing, float fishing and feeder fishing has been developed that is perfect for the job, something that I’ll cover in the next few weeks. The great thing about carp in heavily stocked waters like these is that you can find them just about everywhere. Not only can they be caught on the bottom but in mid water (a neglected method that I’ll cover later in the series), and on the top too. Carp certainly like cover so features like islands, weed beds and rush beds are favourite spots. The great thing about carp is that there is no set method of catching them. Simple baits like worms and bread are just as likely to catch you some fish as boilies and pellets. If you are really lucky you may find a water that holds true crucians. Far from extinct these shy biting beauties can provide excellent sport to those that know how to go about catching them. Often the biggest problem in catching crucians from a commercial water is that the tactics required to catch them make it difficult to avoid the carp, bream, tench, roach…..and so the crucians barely get a look in. Their favourite spots are often very close in, at the base of the near slope, and this can be as little as four or five feet out from the bank. One habit of crucians, apart from the finicky bites they’re notorious for, is that they rarely seem to feed in the winter. They don’t grow as big as carp by a long chalk; a two-pounder is a good one and a three-pounder a fish of a lifetime. To anglers experienced in catching lots it is not too difficult to tell them apart from another fish that has been widely stocked in the mistaken belief that they were actually crucians – the brown goldfish. But many anglers catching goldfish are adamant that they are catching crucians, and it is only when good photos are compared that it is possible to see that they are probably mistaken. This is the feral or wild form of goldfish usually known as brown goldfish though you will come across the more gaudy and exotic forms from time to time. The tactics that will catch crucians are usually effective for goldfish. One difference is that goldfish seem more willing to feed in winter, at least on milder days. A similar looking fish that has become more common is known as an F1, which is a scientific term for hybrids of any type (F for filial, 1 for generation 1) but in this instance it is referring to a deliberately bred hybrid of carp and crucians. The thinking is that these F1’s will not grow so quickly as carp, and therefore provide consistent sport. The jury is still out on them as they have only been stocked widely in the last two or three years. Treat them as you would crucians and you won’t go far wrong. Once Britain’s most popular fish and even now taking second place only to carp, it is usual to find roach in the typical commercial fishery. Left alone roach have a tendency to over-breed and become stunted. That can mean lots of tiddlers. But given careful management, roach can reach specimen size. In practice this means removing surplus stocks on a regular basis and preventing cormorant predation. Those waters whose owners have done this well have roach over two pounds, occasionally over three pounds, which are fine roach by any standards. Roach fishing requires finesse to get the best out of it, though roach can be sufficiently obliging to get caught by the novice. Roach are good fish for learning in that they can be caught using simple methods and baits like maggots and casters. They can teach you much about presentation, and as you improve in that area you are more likely to catch bigger ones. Pole fishing is an ideal way to catch roach on this type of water. You may find that the waters you are fishing hold bream and tench. In general terms tench struggle when stocked into small waters that have a very large head of carp, but where there is more room, such as in gravel pits, they can do very well. They can often be caught close in, near to features like weedbeds, but don’t fish too light as tench are one of our hardest fighting coarse fish. They remain one of my favourite species. It’s a similar story with bream. Many waters don’t have them, and those that do can struggle to maintain a head of decent sized ones, as given half a chance you can end up with a water full of stunted half-starved skimmers. I must admit that on one or two gravel pits I fish for decent tench the skimmers that seem to appear by magic as soon as you put some feed in are far from welcome. Bream certainly seem to do better on much bigger waters where the shoals of bigger fish can patrol at range, where feeder tactics are useful. Perch are a neglected fish as far as commercial waters are concerned. And yet many commercial waters have exactly the right conditions to produce exceptional ones. Teeming with small roach, rudd and other small fry, and with enough features to provide cover, perch can reach two or three pounds with ease in this type of water. What’s more, some of the very biggest perch are coming from this type of water with a few going over five pounds. To the perch’s advantage is that as a species it is neglected and the typical tactics of using baits like pellet, sweetcorn and meat very rarely tempt them. This means that many anglers don’t even know that they are in their water. One lake that I used to fish a lot produced plenty of perch on caster up to about a pound but the big ones needed different tactics. With a keepnet ban in place the wily big perch had learnt to hang around less than a yard from your feet to ambush the small roach as you returned them. Those anglers that realised this set to work with a pole and single maggot, catching and returning a steady stream of small roach. After an hour or two, a little roach was lip-hooked on a size 8 tied to 5lb line, Avon rod, no weights or float, and dropped in just like the previous ones. Takes were instant, and this tactic produced fish to 4-12; my best being 3-1. Provided there is no rule against it, this may be worth a try, especially if you suspect the water of holding big perch. There are a few other species that you may encounter; rudd sometimes turn up though usually only small ones. Chub can do surprisingly well in stillwaters, the current record came from a lake on a boilie. One tactic that can work for stillwater chub is fishing up in the water with a waggler float and maggots. A few waters have some real exotics; orfe, grass carp, golden tench, even pumpkinseed. Other fish that I’ve encountered include dace, eels, grayling, trout, pike, silver bream and, controversially, barbel. So as you can see, it’s not all carp.